Länsimetro Oy and Parma Rail Oy have agreed on the delivery of sleepers for the Western Metro’s Matinkylä–Kivenlahti section. The delivery will consist of a total of 27,400 sleepers. Parma Rail will also supply sleepers for West Metro’s second phase from Matinkylä to Kivenlahti. The delivery is valued at around EUR 2 million. The deliveries, involving altogether 27,400 sleepers, will begin in the summer of 2020, continuing until the end of 2020. Parma Rail was also Länsimetro’s partner in the first phase of the project, for which it delivered some 47,000 sleepers between 2013 and 2015. “Once again, Parma Rail provided us with an expert partner for this subcontract. 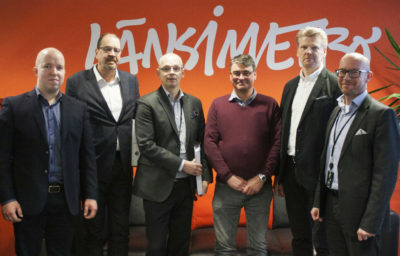 This project will incorporate altogether 24 subcontracts spanning the entire metro line,” says Länsimetro Oy’s Technical Director Raimo Kaunismäki. Parma Rail’s CEO Markku Järveläinen says that production of the sleepers will begin at their Forssa plant next summer. “The order came at a key moment. There are of course several major rail traffic projects pending at the Finnish Transport Infrastructure Agency, but they are still awaiting implementation decisions,” Järveläinen explains. West Metro’s second phase is estimated to reach completion in 2023. Construction on the rail line and stations will continue up until 2022, followed by the commissioning phase. It includes the acceptance of contracts, a comprehensive testing phase and approvals by public authorities. Länsimetro Oy will have completed its task when the metro is handed over to the operator so that preparations for transit operations can begin.